Women vote on the issues. The world around them may change and new issues may arise thereby making voting more complicated, but women will voice their concerns by choosing a candidate after carefully studying the issues. Candidates may use countless of means to covet their vote, but in private, women are concerned with the basic things that will affect their money, the safety of America, and their families. 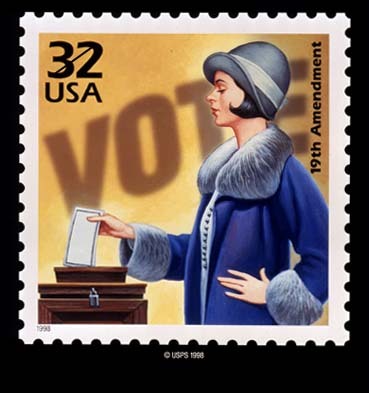 With the enactment of the 19th Amendment, women won the right to vote in 1920 but the elections didn’t see much of their participation immediately. Rather, it seemed that they settled to the back, uncertain at first on how to use this new found power. While Historians claim that there was apathy among women voters at first, it appears that they were more cautious. It was thought they took a big sigh to eye and figure out how to exactly how to use this new responsibility. For example, in 1929 women were in fact drawn to the Presidential election to support the candidate that they liked. Al Smith (D) was a New Yorker and anti-prohibition candidate, while Herbert Hoover (R) was the quiet candidate who was pro-Prohibition. Women could associate with conservative thought and Hoover. Moreover, Hoover was the Food Administrator during the Great War, something women saw as “familiar.” These were two basic but important issues to women and how they thought and more importantly, these issues directly affected their family. As a result, Hoover won the Presidency with, 41% percent of the women vote as compared to 35% of the male vote. As women became more politically savvy, female voters were already setting the litmus test on how they would determine how to vote on issues. Women voters were using their everyday life to discern those issues that were important to them when deciding to support a candidate. By the time Franklin D. Roosevelt was elected, men voted as democrats at a higher rate than women. As this was a time of great economic depression and new situations, women retreated to assess the development of these issues. Women were the head of household during the depression. Although, they did not vote in a high number, they were acquiring new skills that would test their new found responsibilities. The last part of Roosevelt’s term saw the beginning of World War II which turned some women into hard workers. For example, women were left as single parents or widows during those bleak times, as a result of the War. Moreover, women learned new skills of survival that included managing their own money, entering the workforce is vast numbers, and voting according to their “needs.” This was the first time that they were able to demonstrate how their survival depended on their own sense of responsibility to their country and their family. By this time, they had developed a trend of stepping back to assess, learn, and then decide their vote. It was a trend that would continue even to date. 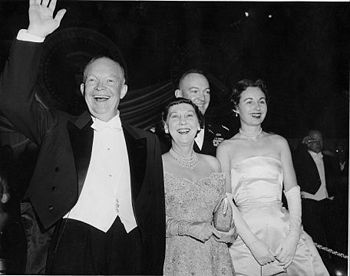 Women’s voting power reemerged during the election with Dwight Eisenhower, who won two terms. Women declared, at that time, that they had in fact, “put him” (Eisenhower) in power from 1953 to 1961. There was probably some truth to that. For the first time since obtaining the right to vote, women voted, at a 6% rate higher than men. But what drove them to the polls? Perhaps it was that women saw issues as the Korean War, inflation and corruption in D.C. as problematic. Hence, the only way to show their disdain against these issues was to use their voting power. They did. Women by this time had learned how to protect their interests by using their vote. During the Eisenhower era they voted for a leader who brought calm after a war. Eisenhower created jobs with his highway plan and America was at a calm state since the end of the war. It was a prosperous time for America, and for the most part women felt that their families were unified and protected. The issues affecting the nation existed, but the economy provided for a time where women could focus on raising their families in a two parent household since before the war. It was a decade of prosperity, safety, and family stability and something women desired when selecting their candidate.